In January 2018, at its Special Session at the Annual General Meeting of the World Economic Forum, the Broadband Commission extended and updated its existing five broadband targets to a total of seven targets. This report consider progress across all seven targets. Policy analysis and targets can play a significant role in informing, shaping and influencing policy priorities at the national and regional levels – for example, Viewpoint 11 describes how policy analysis has helped concretize policy thinking and priorities, from the perspective of the Government of Rwanda. Growth in the number of countries with NBPs has shown good progress, but has effectively stabilized over recent years (Figure 10, left). According to ITU data, 81% of all countries now have a NBP, at 159 countries in 2018, up from 156 in 2016 and 151 in 2015. 35 countries do not have a Plan (Appendix 1). For example, in Lebanon, the state-owned fixed-line telco, Ogero, has developed a network and Internet strategy. This plan for a national fibre-optic upgrade aims for 85% of Lebanon’s population to access the Internet at speeds over 50 Mbps (ten times faster than many current connections) by end 2020. Investments of USD 99 million are planned in the fibre project investment in 2018. Ogero’s fixed voice network equipment upgrade is scheduled for the end of 2018, and wireless Internet coverage for rural areas for mid-2018, with the public Wi-Fi programme due to end in 2018 (1). Number of countries that have adopted a Plan or Strategy, planning to adopt or without (left chart); Growth in National Broadband Plans, 2006-2018 (right chart). Source: ITU. Note: Charts based on data for 196 countries. National Broadband Plan or strategy includes: a plan, strategy or policy specific to broadband; digital plan, agenda, strategy or policy; ICT plan, strategy, or policy; or a communication plan, strategy, or policy. Viewpoint 12 from the OECD discusses how national broadband availability targets are evolving. One obvious way in which NBPs are evolving is to include new technologies, such as IoT. For example, China has a national strategy for IoT. Following efforts by government and industries, China has built a huge narrow-band cellular IoT network, with over 700,000 active sites. In 2018, applications will exceed one million connections (including smart fire, smart gas, smart water and smart home), and a large number of innovative applications are emerging (including connected cattle and electric vehicle monitoring). Another way in which NBPs should evolve is to take into account AI and data. According to Tim Dutton (2018), at least 15 countries have concrete national strategies for AI, while another six countries are working to develop their strategy. In its “Data-Driven Development” report, the World Bank (2018) notes that “there is growing recognition within many governments that, in the digital economy, data is on par as an infrastructure asset with more traditional infrastructure like transport and public utilities. There is now interest in crafting policy that recognizes data as an infrastructure asset (2). Policies that discuss data infrastructure in the government typically focus on management of data assets (collection, access, reuse, sharing, preservation, security) and data governance (ownership, funding)” (3). This implies data is an asset, similar to other infrastructure assets. Of course, while important, national broadband strategies are just one part of the regulatory and policy framework in place to govern the development of broadband in a country. 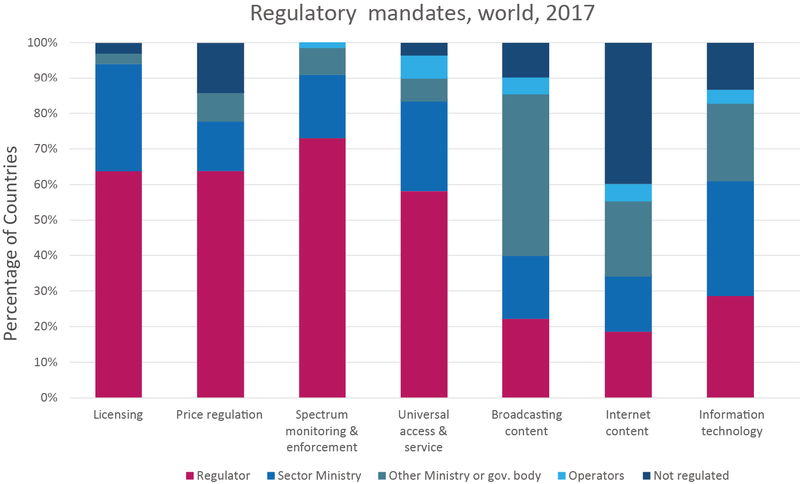 Countries also have broad sets of telecom and broadband regulatory requirements in place – for example, relating to the mandate of the regulator, as well as net neutrality. Of ITU’s 193 Member States, 45% of countries have no clear policy statement on net neutrality in place, with the highest proportions in the Arab States (80%) and the Americas (71.4%). Europe is the region with the highest proportion of countries with a statement or policy on net neutrality in place (70%) – Figure 11. Source: ITU World Telecommunication Regulatory Survey 2017. * Total 193 ITU Member States. 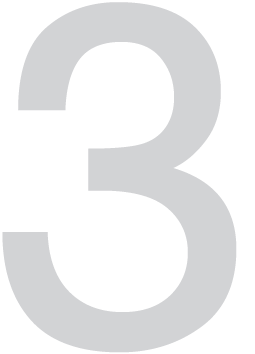 According to ITU’s Global Regulatory Outlook Report 2017, a growing number of countries have adopted or are in the process of adopting more flexible regulatory frameworks over the past decade, with a small, but growing, number of ICT regulators including the regulation of Internet content in their remit (Figure 12). Most regulators still focus on ‘traditional’ areas for ICT regulators, such as licensing and spectrum monitoring and enforcement (Figure 12). Figure 12: Who Regulates What in ICT? Source: World Telecommunication Regulatory Survey 2018. * Total 193 ITU Member States. Analysis of countries’ regulatory frameworks shows that a growing number of countries have adopted general or class licensing. ITU holds an annual Global Symposium for Regulators to debate the latest issues, review international best practices. ITU publishes its Global Regulatory Outlook Report annually to track regulatory developments around the world. Some countries have been moving to merge regulators – the most recent is Zimbabwe, which merged its telecom and broadcasting regulators, on the basis that telecoms show convergence with broadcasting (5). For example, in Singapore, the converged telecommunications and media regulator, IMDA, has adopted a regulatory sandbox approach to enable the industry to test innovative technologies. For instance, to facilitate trials of TV white spaces and 5G echnologies, IMDA has waived certain licensing requirements and frequency fees. To encourage trials in Heterogeneous Network (HetNet) technologies as the next step in Singapore’s infrastructure, IMDA has offered grants to firms to roll out HetNet solutions at specific locations and facilitated access to buildings. Mobile broadband is more affordable than fixed-broadband services in most developing countries. For example, in LDCs, on average, an entry-level fixed-broadband subscription is 2.6 times more expensive than an entry-level mobile-broadband subscription. Mobile-broadband prices as a percentage of GNI per capita halved between 2013 and 2016 worldwide. The steepest decrease occurred in LDCs, where prices fell from 32.4 to 14.1% of GNI. However, mobile broadband prices are still significantly more than 2% of GNI per capita in most LDCs and unaffordable for the large majority of the population. In January 2017, the Broadband Commission lowered the de-facto standard for Internet affordability to 2% of average income, from the previous <5% (6). For the fixed broadband sub-basket, 73 of ITU’s 193 Member States benefitted from an Internet package costing <2% of GNI per capita. 122 countries have not achieved the target (Figure 13). No single LDC has achieved this 2% target, while only five developed countries have not yet achieved the target, all in South-Eastern Europe (Albania, TFYR Macedonia, Moldova, Montenegro and Serbia). For the handset-based mobile broadband sub-basket, 109 of 192 countries enjoyed an Internet package costing <2% of GNI per capita, leaving 86 countries which have not achieved the target. Here, four LDCs have achieved the target (Bhutan, Cambodia, Lao PDR and Sudan), but nearly all developed countries have already met this target, with only two developed countries yet to achieve it (Bulgaria and Montenegro). Viewpoint 13 describes Singapore’s initiative to help realize more affordable connectivity for all walks of life. Three years is an eternity in telecom, so targets for 2025 are clearly optimistic at best. Estimates of Internet usage are based on a number of assumptions, each of which can be challenged. For example, it uses median population projections from the UN (extrapolated between 1 July estimates for each year), subject to various caveats (e.g. no major epidemics, conflicts, famines, and constant fertility rates). 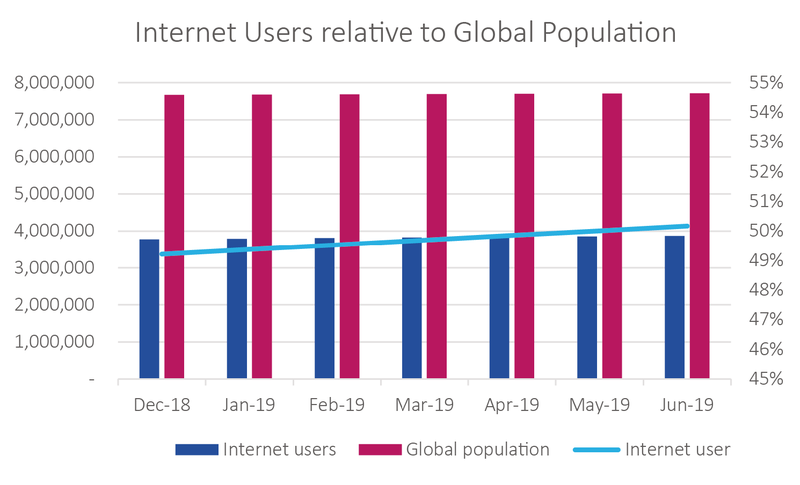 Internet user growth rates are gradually reducing,Internet user growth rates are gradually reducing, at around 5.5% Internet user growth for 2018, as easy-to-reach areas get connected. Having said this, there are significant Internet mass connectivity projects underway in some regions, and mass area coverage by next-generation satellite. The total number of Internet users can in fact go down, as well as up – for example, as Governments and regulators revise their figures for inactive SIM cards or the latest consumer surveys. Each national figure is an estimate, based on operator subscriber data and/or consumer surveys, which may be more or less representative of each market, and the quality of the estimate depends on the quality of surveys. Arguably, it is not just access and how many people use the Internet which is of interest; it is how the Internet is used and the quality of usage that matter. For example, in 2017, an estimated 1.66 billion people (under half the global population online) purchased goods online. Even in developed countries, large gaps persisted across OECD countries for some Internet uses as recently as 2016, with less than half of all online Internet consumers using the Internet for telephony, content creation, travel, software download, cloud services, online job searches and sales (7). Viewpoint 14 explores the case of broadband in four developing countries – Cambodia, Rwanda, Senegal and Vanuatu. * Figure is based on the ITU 2017 data and doesn’t reflect the ITU 2018 Global and Regional ICT estimates and the ITU’s “Measuring the Information Society Report 2018”.